Sunday marked our inaugural Meso event, celebrating corn as integral to Mexican cuisine and a staple of Midwestern agriculture. We welcomed our preliminary guinea pigs, friends and family members Vicki, Scott, Vanessa, Sam, Moe, Kiyoto, Sam, Kelley, Elodi, Megha, Anna, Francisco, Felipe, and Walter. Our guests drank Café de Olla, warming their hands and mouths as they became better acquainted. After a few remarks, we distributed rating cards and allowed our testers to begin their hard work. Our group rated this recipe an 8.4 out of 10, calling it “comforting,” “spicy,” and “molassmas.” One tester said, “Literally never had better coffee in my life. This would keep me warm all winter.” Thanks! We like you too. This recipe was the crowd’s overall favorite, giving it a solid 9 out of 10. Every single member in our creative group said yes, they would make this recipe for their friends. They called it “zesty,” “bright,” “4-H Fair,” “surprise,” and “suede.” Some noted that the flavors came in “stages,” and another suggested we cut down on the butter. Everyone agreed that the lime zest was the key to transcendent popcorn. 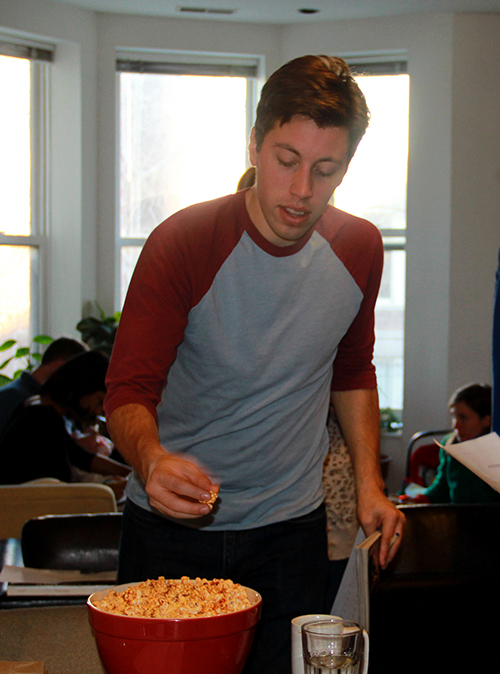 Our next popcorn was a caramel corn–an homage to Chicago as the birthplace of Cracker Jacks. Finally, our last popcorn was a variation of the cajeta popcorn, this time with bacon–a shout-out to the “hog butcher for the world,” our fair city, elegantly nicknamed by Carl Sandburg. We cooked four slices of bacon, and stirred in the bacon fat with the cajeta instead of butter. 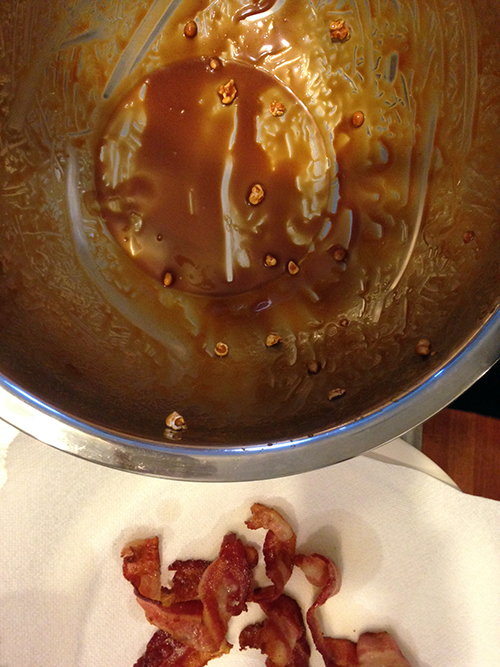 Then we crumbled the bacon in with the caramel and baked it like the last one. Our guests rated it an 8.2 and one amazingly nicknamed it “pigoat.” Other comments included “VELVET,” “smooth,” “male,” and “soothing.” One guest suggested we try other meats like chorizo or pancetta. Yes, we love this idea. But more than this delightful feedback, our group gave us very real and meaningful insight to a question we posed: What role does authenticity play in food? We will need a bit more time to digest the amazing discussion and comments we received in response. More soon on this, we promise. 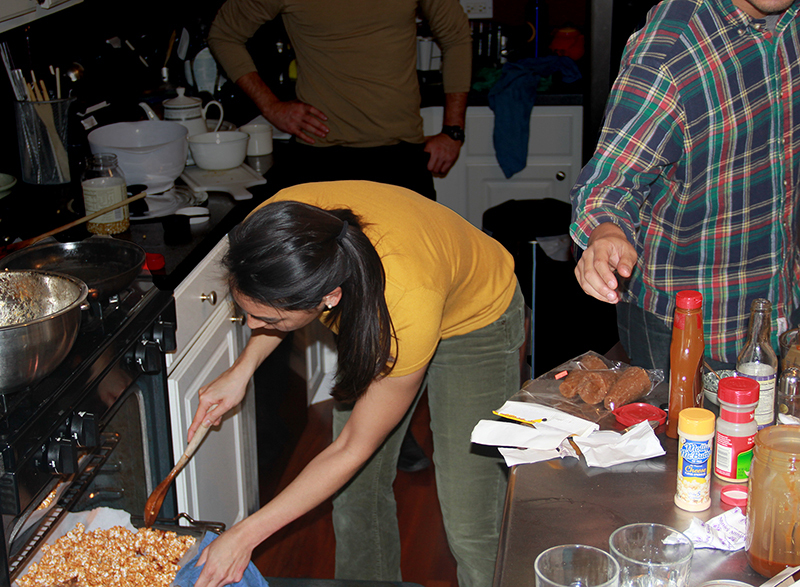 The evening ended with guests making their own Chicago Mix popcorns, playing off of the combination of cheese and caramel corn that Garrett Shops sell. Their version is trademarked. That’s fine, we’re calling ours The Chicago Mixed, a celebration of hybridity and multiplicity in identity. Zesty-cajeta-lime-chili-bacon-suede-Chicago-Mexican corn. Try our recipes at home and let us know your thoughts. What did you try? We’d love to hear about your variations! Photos courtesy of Elodi and Vicki.